Vendí mi Dodge Ram 2012 a buen precio gracias a Fernie Jr & Luis, pregunten por ellos cuando lleguen a San Diego auto connection. First time buying a 2015 Hyundai Elantra with the dealer Junior .Took me for a test drive and I fell in love with the car! Great car and great deal! Thank you Junior! Luis Gabe, JR and Moe were amazing in service and respect. They did the unbelievable by getting me car I needed for work and family. I now know why the sell so many cars. I'm a customer for life!! Thanks guys! Great place. They are awesomeee. Will highly reccomend. JR and the owner, Steve were extremely helpful and accommodating. They were willing to work with us and our financial situation when buying our vehicle. I would 100% come back and highly recommend stopping by if in the market, buying OR selling. Hands down best auto dealership in san diego. Highly recommend! The guys were great! We got a great deal on a beautiful car and were in and out very quickly! Highly recommend. luis mi amigo gave me the highest & fastest offer! took me less than 15mins to do all the paperwork. recommended! Great customer service. Dale was great and would highly recommend going thru him for your next car purchase. Entire staff is friendly and professional. Entire process was flawless from start to finish. Thank you for the world class service. Super easy experience! JR is easy to work with and talk to. Good info and final deal from Gabriel. We got a great car down there. They are supper friendly and efficient. Great car buying experience, great place! Thank you to Fernando and dale. Luis R. And JR helped me out with a good deal and were real down to earth, made everything a smooth and easy process. Recommend asking for either one to help you get deal. Great, quick, smooth and extremely friendly service/experience! Highly recommended his service any day! Mr. Luis is a great professional; he’s the sort of person you form instantly friendship with! We had a great experience with San Diego Auto Connection. Gabe and J.R. are very helpful and personable. All the staff is very friendly and show they care for the customer and their needs. They got us in the car we wanted at a great price. We we're very happy and highly recommend them! Daniel was a lot of help and is a very great guy!! Came here and bought my first car today with JR Fernando!! Awesome service!! Luis was very helpful, nice, and knowledgeable! He answered all my questions without hesitation and I didn’t feel pressured by him at all. I will refer everyone who is looking for a vehicle to this location. Sold my car to jr and gave me a great price also the manger Fernando was very helpful. Thank you San Diego auto connection. Sell you used vehicle fast and easy. Really cool folks. Gracias Daniel por mi nuevo carro está bien perron. Best car lot thus far in San Diego, Ca. I came in unhappy because the car I wanted was a bit much but thanks to Peter, and his Manager Fernando; they sat me down and put together the best and unbeatable plan for me and my dream car. ?? would definitely recommend this car lot to others. Thank you San Diego Auto Connection!! Excellent place for buying or selling. They have me a way better offer than other dealerships. Thank you Jr for all your help in selling my car . Daniel was sensational. The team here at San Diego Auto Connection was super friendly. I never once felt pressured to commit to selling my vehicle to them, and they made me feel at home. While they worked on my appraisal they chatted me up and made me feel at ease. I would definitely recommend them! Got a quick appraisal done on my truck and a free Carfax. They gave me anstrong offer that I will most likely take in a few days..
We are proud to provide 5 star customer service.But don’t take it from us.Read what our customers have to say about San Diego Auto Connection and our certified employees. Went to san diego auto connection to look at a nissan Altima, didnt think i was going to buy it . Jr and fernando the manger made me feel like family. Daniel assisted me with the purchase of my beautiful Honda CRV and I couldn't be more pleased. He had a great attitude and helped me make a deal that I was comfortable with. I highly recommend Auto Connection San Diego. I had many choices, and they gave me the car I wanted and a deal that I could live with! Thanks Daniel and your great team! Great prices and great people , would definitely recommend them to everyone! Great Customer Service! Perfect response.Trustful company! These guys are very professional and honest. They do great work and it is affordable. This is the best place to buy a car in the whole of San Diego. This car dealer really knows how to treat customers and make them feel like VIP. I'm quite impressed with the staff that attended to me and their price too was moderate. Good job! Great people, good cars, clean store... They're the best! Amazing service!!!! Always getting the job done!!! Los muchachos de Auto Connecion son profesionales, y mas que nada saben ayudar a la raza. Pregunten por Luis o el Jr.
Best customer service experience i have ever had at a car dealership! Good honest peiple and great deals! The guys at SD auto connection are great, these guys take customer service to a new level. I was driving by and needed help with directions and the two guys at the front were awesome! Lewis printed out the directions for me and offered me water and snacks from their lobby. How awesome is that? Marco was awesome and met my asking price. Highly recommended if looking to buy or sell a vehicle in San Diego. GO Padres! The manager Fernado and the salesman Daniel incredibly nice and helpful, the quality of the car is of really high quality. I would recommend this place. Jr was a big help to my friend and myself. I really enjoyed the process and the Manager Fernado is really nice and he had helped me A LOT. I would def recommend this place. I seen a car online and I seen a vehicle online I immediately I called San Diego Auto Connection. I spoke to Daniel and he was willing to come and pick me up. I test drove a Kia Sportage and immediately fell in love. their financing is awesome. would highly recommend this place to anyone looking in buying a vehicle. What a great place. Fast, friendly and all around good people! Highly recommend. Seamless process working with Max and a great deal!!! San Diego Auto Connection made my car buying experience very easy. I would definitely recommend them to others that are looking for a fast and easy way to purchase a quality car. Ask for Fernando or Gabe! They are the best! Awesome place, If you, family, or friends ever decide to sell or buy a vehicle you might want to consider checking out San Diego auto connection. You will be treated like family. I have seriously bought eight vehicles at this place. One of the reasons why I continue to come back is the way their operation is Ran. Simple, fast, and easy . Highly recommend if you’re looking to buy or even sell your vehicle consider San Diego you won’t regret. It’s been 3 years since I bought my 2011 Toyota Tundra from San Diego Auto Connection. It was a great deal then and continues to be!!! So nice to have a vehicle that runs now like the day I bought it!! I benefited from their focus on quality! ???????????? The dealership is clean and friendly. The service was good and the communication was very good. The pricing was fair and the staff took time to explain everything. Honest people and a great selection of cars. They will go above and beyond to find you whatever car you want. Won’t buy a car anywhere else. We had a great experience with San Diego Auto Connection! Yes! Would recommend! Thank you Max and team! Marco Garcia and Fernando Mercado helped us with our purchase of a 2012 Jeep Wrangler. They were both exceptionally helpful and courteous. I would recommend San Diego Auto Connection and especially Marco and Fernando to others. Call JR really good people. Work out great deal. Best customer service. Really honest and good people! I would recommend you to buy a car from them. Ask for JR or Gabriel. This dealership was great when it came to answering all my questions... I didn't get you typical " run around". They were straight to the point and I drove away in my dream car. As a side note financing was very easy, I would highly recommend!! This dealership is very professional and provides a layer back atmosphere along with the best prices in town. I would recommend this dealer to anyone. Luis was very helpful and polite from the beginning to the end. It was a most plesant car selling experience ever. 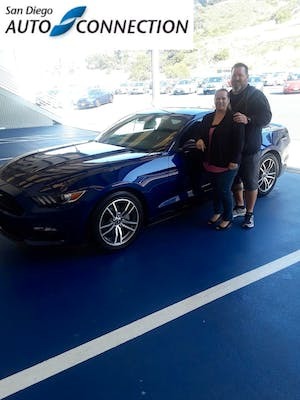 The team at San Diego Auto Connections did an awesome job at getting us what we wanted at a price point we were happy with. Special thanks to Fernando and Marco for going above and beyond our expectations. They worked tirelessly with the banks to get the price and rate that we wanted. Couldn't ask for better service from better people. We would recommend San Diego Auto Connection to anyone interested in buying a car. 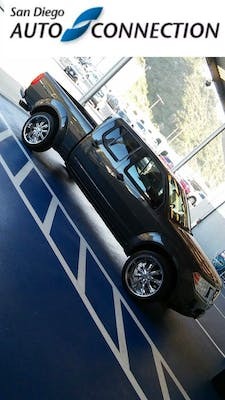 We purchased a 2012 Nissan Frontier through SD Auto Connection and very glad we did! We got an awesome deal for a really good car. Daniel and Fernando were AMAZING! Really good guys and would highly recommend them to anyone!!! They were not pushy at all and made us feel really comfortable at at ease through the process. Everyone there was great, even the financing guys! Thank you SD Auto Connection for everything! I would refer anyone looking to buy a car/truck to go to them! Came to San Diego auto connection to sell my Honda accord sport JR help me with the transaction gave the manager was a very nice gentleman and gave me what I was looking for I do recommend this place to sell your car. Luis was a pleasure to work with. In and out pretty quickly. Sold my car at a slightly higher price than CarMax. We are proud to provide 5 star customer service.But don’t take it from us. Read what our customers have to say about San Diego Auto Connection and our certified employees.